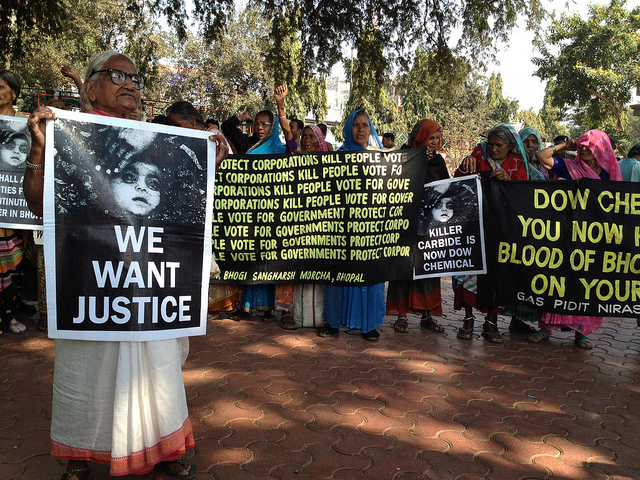 The International Campaign for Justice in Bhopal (ICJB) is looking for an energetic, passionate and experienced campaigner to assist the survivor groups of Bhopal in their campaign for those affected by the poisons of Union Carbide & Dow Chemical in Bhopal, India. ICJB is a coalition that comprises survivors of the disaster, international volunteers, and environmental, social justice and human rights groups. Using education, grassroots organizing, and non-violent direct action, ICJB works to hold Dow Chemical and the Indian Government accountable for the ongoing chemical disaster in Bhopal, India. ICJB is led by half a dozen Bhopal survivor organizations working in close alliance with coalition members in India, Canada, the United States of America, and the United Kingdom. Organize and work in gas-affected and water-affected communities in Bhopal. Leadership development within the gas affected and water affected communities, including amongst Children against Dow-Carbide members. Build new alliances and strengthen existing alliances within India with, trade unions, women’s groups, student groups and other relevant groups. Organize campaigns, direct actions and demonstrations specific to medical care, environment, economic & social rehabilitation, and justice for the Bhopal survivors. Coordinate and manage all logistical arrangements for various campaign activities. Coordinate, support, and give direction to the work of Bhopal-based field campaigners. Liaison with ICJB-North America and ICJB-United Kingdom. Undertake fundraising for Bhopal-based campaigners and expenses for Bhopal campaigns. Represent the Bhopal campaign at local, national and international forums. The candidate may have to work some evenings and weekends, as well as work with supporters in other time zones. Minimum Qualifications: Experience of at least 5 years in grassroots campaigning, Basic knowledge of the Bhopal campaign’s history vis a vis legal interventions, medical care, environmental campaigns, corporate accountability campaigns, etc. Written and spoken fluency in English and Hindi. Strong written and verbal communication skills, and experience working with the print media & social media. Experience in campaigning, preparing communications for the survivors, media, etc, public speaking research and documentation Filing Right to Information petitions & presenting its analysis Willingness to travel frequently, regionally, nationally and internationally. Experience in logistics[R3] and event planning. Computer literate and email savvy, web-hosting skills, and basic MS Office. APPLICATION PROCEDURE: Interested candidates can forward their resume and a cover letter, detailing their interest in the position, to Rachna Dhingra. Shortlisted candidates will be invited for Skype and in person interview. Email: rachnya@gmail.com. Last date to apply is 30 August, 2018. PrevWhy Is Every Monsoon Bringing Devastation for Uttarakhand?